Image Description: The background of the image is a navy blue couch with an alternating pattern of dark yellow fleur-de-lis pattern and a maroon-red pattern. The foreground of the image is focused on a small fuzzy object, it’s robin’s egg blue and it resembles a narwhal, however, there are some small differences. There to two small white fuzzy fins to the side, there is a white and blue spiralled horn at the top of the forehead. Nadia the Narwhal has large anime-style blue eyes and blush stickers as well. Image Description: The background of the image is a navy blue couch with an alternating pattern of dark yellow fleur-de-lis pattern and a maroon red pattern. The foreground is focused on two objects: from left to right, a large squishable strawberry with a metallic sheen coating on the surface of the strawberry. the strawberry is a gradual blending of blue, yellow and pink. 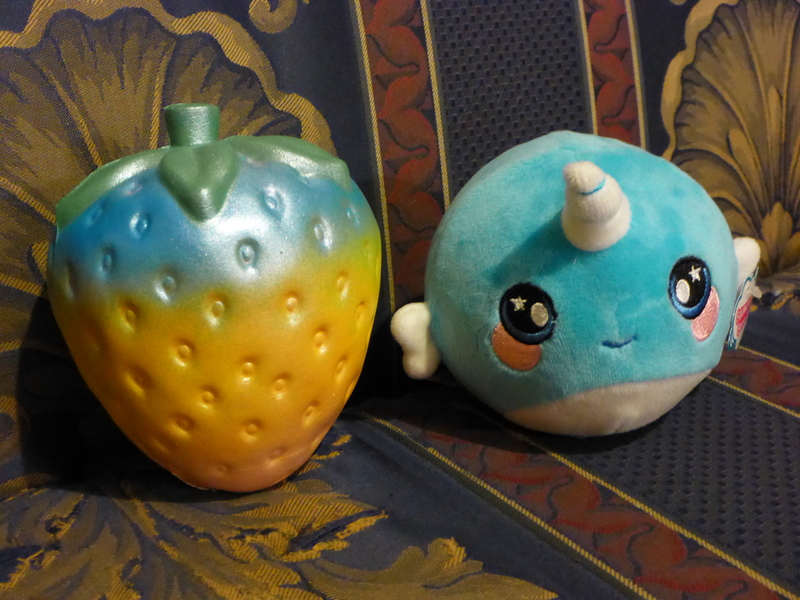 Next to the strawberry is Nadia the Narwhal sitting next to the strawberry. 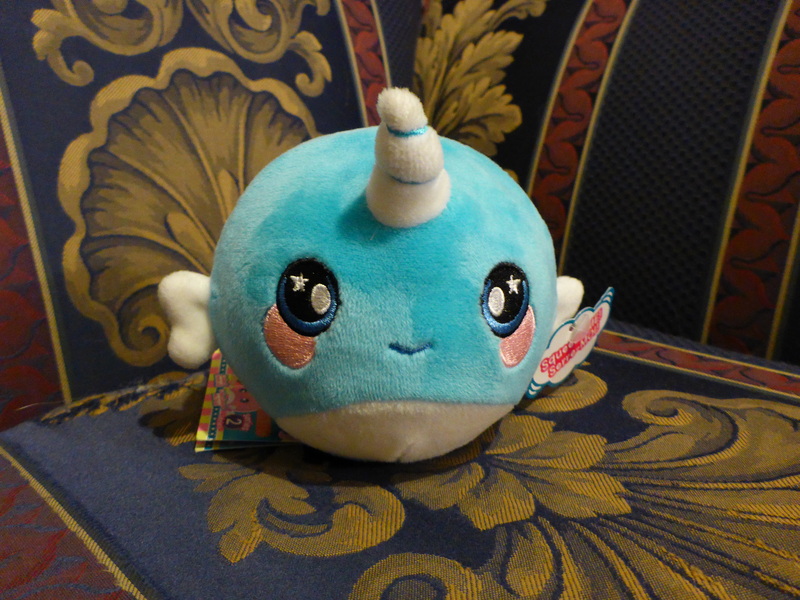 Nadia is a robin’s egg blue narwhal, with big blue anime-style eyes, blush stickers, little white fins on the side, a white and blue spiralled horn at the top of the forehead. My partner and I were in Target and we were looking at their collection of plushie soft-toys. I was tempted by the Rainbow Llama (I still am tempted by the rainbow llama if I’m being honest) and I also noticed the small collection of Squeezamals that the store had available. K.A. 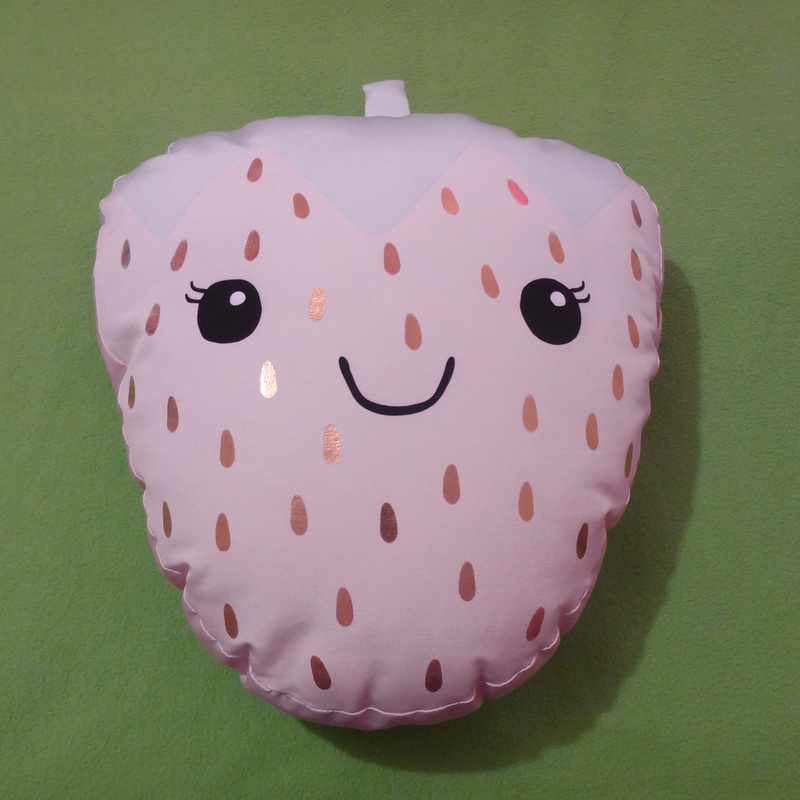 @ Stim Toy Box has written a few posts about this type of plush toy (links down below) and I was determined to get one for myself. Nadia the Narwhal was the one that appealed to me most out of the small selection available. I plan to go to my local Kmart to see if there’s a wider selection available there instead. All the Squeezamals are scented items. Nadia the Narwhal is grape scented. I found this irritating, however, the scent isn’t strong and suspect it will fade away in a few days (hopefully). The main appeal of this item, in my opinion, is the soft texture of the plush toy. It’s so soft and excellent for stroking. The item is the same size as my palm and it’s perfect for holding in one hand. Just as a small content warning, a follower on K.A.’s blog pointed out that there is a scripture verse printed on all of the Squeezamals tags, “PHIL 4:13.” to be precise (link has been included down below). I’m not religious, so this doesn’t affect me or my enjoyment of the toy in any way, however, this might not be the case for everyone.